Guava(Amrud) is a nutritious fruit with edible seeds and skin. Several varieties are available with each variety having a unique flavour, colour and fragrance. Ripe fruits have rich flavor with sweet-tarty taste. Guava tree bears numerous round, ovoid or pear-shaped fruits that are about 5 -10 cm long and weigh around 40–200 g. Each fruit contains numerous tiny, semi-hard edible seeds.The fruit is soft when ripe and is creamy in texture.Internally, the flesh varies in color depending up on the cultivar and may be white, pink, yellow, or red. Fiber is important for lowering blood sugar levels. At the same time, it is good in cleansing digestive system and maintaining free bowel movement. Guavas are rich in fibers.Consumption of guavas helps slow down the absorption of sugar in the blood. It is rich in fiber and is helpful for diabetic individuals. Recent studies have shown that a diet that is high in fiber is linked to a lower risk of developing Type 2 diabetes. Deficiency of Vitamin C is one of the main cause for scurvy but due to high concentration of Vitamin-C, guava is used to prevent and treat scurvy. 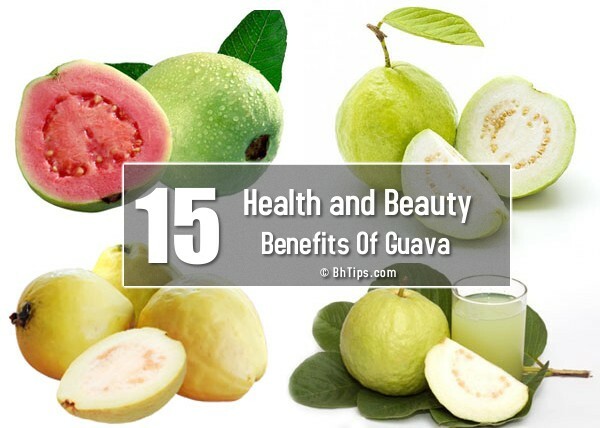 Guava fruit as well as leaves both are highly beneficial in treatment of scurvy. Guava is one of the riches sources of dietary fiber. Its seeds, if ingested whole or chewed, serve as excellent laxatives. These two properties of guava help forming bowels, retaining water and clean your intestines and excretory system thoroughly. Vitamin A or retinol is responsible for good eye sight. Guava is rich in retinol, so if you don’t like carrots, you can try a guava for improving your eyesight. Eye problems can be kept away as guavas contain an abundance of Vitamin A that helps in improving vision. Guava contains good amount of Vitamin A. As Vitamin A is antioxidants, so it becomes highly preferred food to be consumed to improve eye health. Guavas are beneficial in regulating blood pressure. It is said that one guava contains almost a similar amount of potassium that's present in bananas. Potassium reverses the effects of sodium, thereby regulating the balance of blood pressure.Guava contains good amount of potassium. Potassium is required to maintain sodium level. Also high potassium is required to maintain fluid level i.e. to balance electrolyte. Thus it helps to maintain high blood pressure, and it reduces the risk of stroke and heart attack. Guava is very helpful for those who want to lose weight without compromising their intake of proteins, vitamins and fiber. Although guava is very rich in vitamins, proteins and minerals, but it has no cholesterol and a low number of digestible carbohydrates. It is a is very filling snack and satisfies the appetite very easily. Guava, especially raw guava, also has far less sugar as compared to apples, oranges, grapes, and other fruit. Adding a medium-sized guava to your lunch and you will not feel hungry again until the evening. Guava contain a good amount of Vitamin B3(niacin) and B6(pyridoxine). B3(niacin) can increase blood flow and stimulates cognitive function. Vitamin B6 is a great nutrient for brain and nerve function. Therefore, eating guava can help you increase brain function and sharpen you focus. If you want to improve your brain function, guava is best fruit for you. Fresh Guava is very rich in potassium, even more than bananas per 100 g of fruit weight. Potassium is an important component than cell and body fluids that helps control heart rate and blood pressure. Guava contain a good amount of anti-oxidants that prevent the blood vessels from free radical damage and prevent from stroke and heart attack. Guava fruit and leaves have astringent qualities which help to cure loose bowels and reduce symptoms of diarrhea. These astringents are alkaline in nature and have disinfectant and anti-bacterial properties, thus helping to cure dysentery by inhibiting microbial growth and removing extra mucus from the intestines. Furthermore, other nutrients in guava such as Vitamin-C, Carotenoids and potassium, strengthen and tone the digestive system while simultaneously disinfecting it. Guava leaf extract can also increase the number of platelets in the blood. Platelet numbers will decline drastically in patients with dengue fever so easy bleeding. Further scientific research on guava leaves also prove that the guava leaf extract is not toxic at all and safe for consumption. Guava is an excellent source of Vitamin C which make it an excellent immunity booster fruit. Guava increases immunity to protect against common diseases like cough, cold and flu. It also increases immune system function to protect from infections. Guavas contain a good amount of folate (Folic acid). It helps promote fertility in both men and women. It also contains a good amount of vitamin B3 and vitamin B6, vitamin A and magnesium, which all help promote fertility. If you have blackheads, you can blend the leaves of the guava fruit with little water and apply it as a scrub on your nose to remove blackheads. Pink guavas contain twice the amount of lycopene present in tomatoes. Lycopene is an antioxidant that protects your skin from being damaged by UV rays and environmental pollution. Guava is a rich source of vitamins A, B, C and potassium which are good antioxidants and detoxifiers. They fight free radicals, thus keeping your skin glowing and free from premature signs of ageing like wrinkles and fine lines. So consume a guava on daily basis and stay away from premature wrinkles and fine lines.